Four years ago today, I kissed this sweet, elderly little schnauzer goodbye and released her to chase butterflies in heaven. I’ve been thinking about her all day. This is Greta, also known as Greta Garbanzo Bean, Honey Girl and my little Fräulein. She became my dog unexpectedly seven years ago: one Saturday afternoon, I went to Pet Supermarket to buy food for my parrot right in the middle of an adoption event. Overlooked by the crowd of people interested in the puppies and kittens, Greta was alone in a small gated area, sitting quietly, almost willing me to walk over to her. Without considering the consequences, that’s just what I did. And I fell in love. I was not looking for a dog that day. My house was already pretty full with two other dogs, two sons and a parrot. But when I looked into the soft eyes beneath those bushy eyebrows, I saw something there – I saw a soul. I don’t know how else to describe it. This dog looked back at me with eyes that knew me. She didn’t jump up and down or bark excitedly. She just gazed at me with love in her eyes. I returned the gaze and took her home. I thought, foolishly, that I would foster her until I could find another home for her. I mean, how many sane people do you know with three dogs and a noisy bird? I just couldn’t let her go back to the animal shelter. 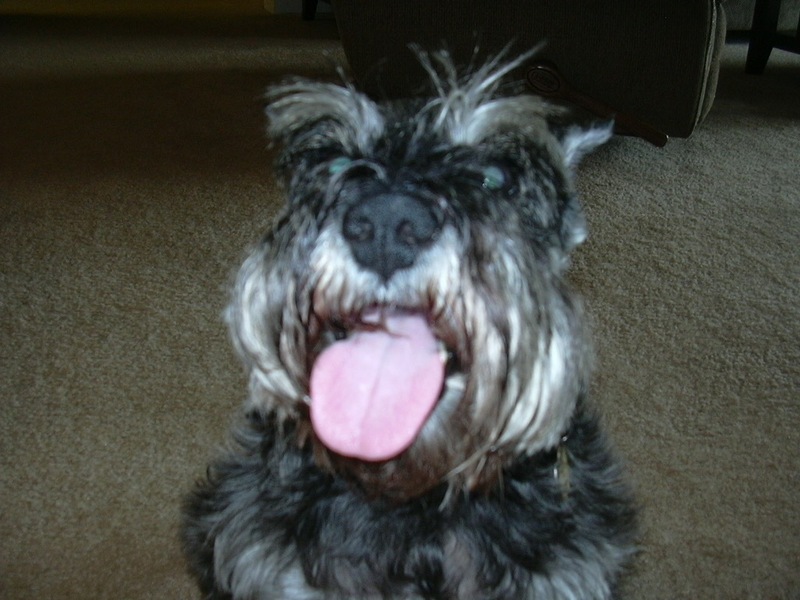 I named her Greta, after my very first childhood dog, another salt-and-pepper schnauzer just like her. Rescue dogs are such a mystery. They come to you with all their past hurts and fears, experiences about which you know nothing. Every time I walked Greta, if a child was anywhere in the vicinity, she would literally drag me over to the child. Then she’d sit patiently, just like the day I met her, graciously accepting the little one’s clumsy affection. Once we were back on our way, she always seemed to have a little spring in her step. Obviously there had been children in Greta’s past life. What was the rest of her story? She’d lie on her back some days and just wave her paws delightedly in the air, grateful to be alive and have a home. I’d ask her, “What happened to you, Honey Girl? How did anyone ever give you up?” I’ll never know. During the time Greta graced my life, lots of things changed. My marriage ended. My kids moved out on their own. I made a new life. In the midst of the uncertainty (and sometimes chaos), Greta was unflappable. She helped me pack. She sat with me while I cried. She watched football with me. And when I met Ret, the man I would later marry, she loved him too. It was during the flurry of our wedding plans that Greta’s health began to fail. She was losing her vision, her body was bloated and she was becoming incontinent. Sometimes she seemed disoriented. I was overwhelmed with a monster project at work. My elder son had just married and joined the Navy, moving a thousand miles away, and the pain of missing him was acute. To say I was preoccupied would be an understatement. Ret and I agonized over what to do for Greta. I didn’t want to torture her with treatments that wouldn’t save her life. So we decided to just keep her comfortable for as long as possible and prayed that it would be a long time. And then, I made a decision that I regret to this day. At the time, I held a service position in an organization and it was time for an important assembly. Members of the group were depending on me to travel to the meeting to represent them and I didn’t want to let them down. I felt so conflicted; I knew my garbanzo bean was struggling, but I told myself she would be fine. Ret would be with her. I went to the meeting, did my duty and came home the next afternoon. Greta had not done well in my absence. Ret cared for her in the most loving fashion but it was becoming hard to pretend that she would be all right. She wouldn’t eat. She was confused by her water bowl and unable to move around much on her own. The next day, when I came home for lunch, I found her lying unconscious in her own puddle. My heart broke. This proud, feisty little dog didn’t deserve to be left in that state. And she didn’t deserve to be alone when she died. We decided to help her cross the Rainbow Bridge. She’s resting now beneath a tree in our back yard. Four years later, I still miss my Greta terribly. Which brings me to the point – actually two points – of this post, besides sharing this wonderful dog with you. I will always regret that I wasn’t home with Greta during her last weekend. I knew how ill she was but I let other people’s expectations of me get in the way of what I believed in my heart was right. Looking back, I wish I’d stayed home from work on her last day, too. Because although the group and the job were high priorities, life and love always matter more. My heart knows this. I’m sorry I didn’t listen to it. I will never have a regret like this again. And the second point is this: I knew when I adopted this aging dog that I would not have her for long. But still I did it. And I’d do it again. How often does a regular citizen get to save a life? Actually, I did do it again. I’ll introduce you to Tanner, our newest pup, in another post. I miss you, my little Fräulein. You are forever in my heart. Thank you! I guess you can tell I learn a lot from my dogs! 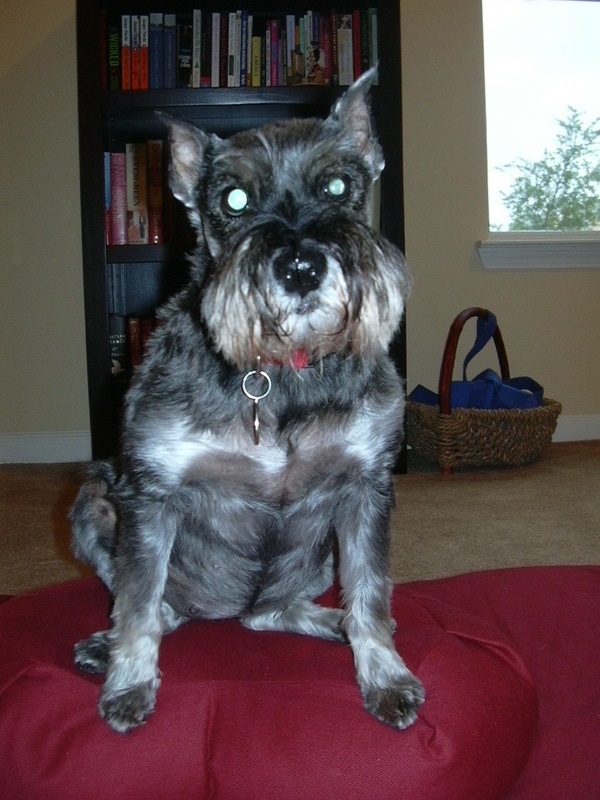 How often does an aging schnauzer, boarded at a “high-kill shelter”, given the opportunity to be adopted to save a “regular citizen’s” life? Greta was with you during the some of the hardest, most painful times in your life. She was there to witness you change from who you thought you were supposed to be to your beautifully gifted True Self. I feel like she accomplished what she was saved by you to do. I believe you are right, your “Honey Girl” was and still is a very special dog. Thank you for the lesson & inspiration. Gina, thank you so much for your thoughtful comments. I love the way you said Greta accomplished what she was saved by me to do. What a lovely way for me to think about my honey girl when I am missing her.